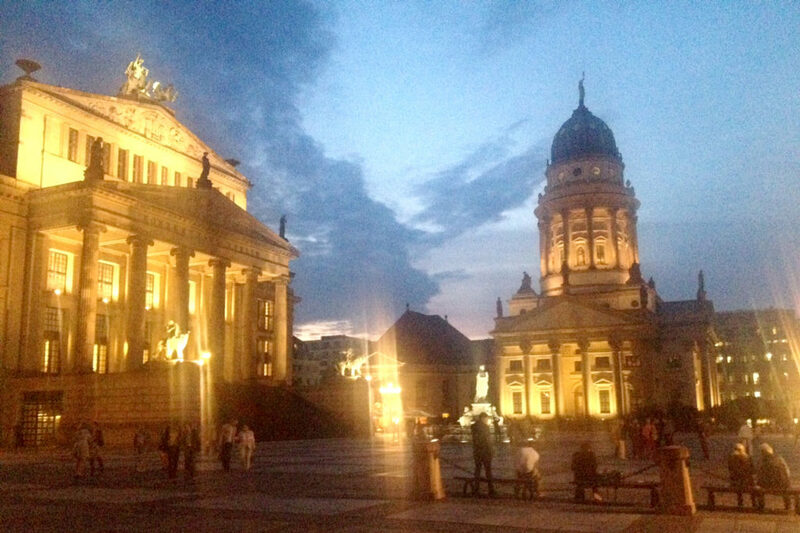 Many people consider the Gendarmenmarkt the most beautiful square of Berlin Mitte – if not of all Berlin. First of all the Gendarmenmarkt is a rather large square, located in Mitte, bordered by the streets Französische Strasse, Markgrafenstrasse, Mohrenstrasse and Charlottenstrasse. The square is mostly known for its architectural ensemble dating back to the seventeenth century, including the Concert Hall (Konzerthaus), the French Cathedral (Französischer Dom) and the German Cathedral (Deutscher Dom). In the center of the square you’ll find a monumental statue of Germany’s renowned poet Friedrich Schiller. During World War II, many of the buildings surrounding Gendarmenmarkt were either badly damaged or destroyed. The East German / East Berlin government put great efforts into rebuilding the iconic three buildings – which can be seen a stroke of Luck of History, if you consider that lots of other damaged historical buildings were simply torn down in Post War Berlin.